This early surname is of medieval English and Scottish origin. It is one of the diminutive forms of surname that was developed from the male given name "Adam", a name introduced by the 12th century Crusaders and pilgrims returning from the Holy Land. The name Adam is Hebrew and derives from the word for earth. The name rarely appears in Britain before the Norman Conquest of 1066, and then always as the name of a monk. The popularity of the name increased rapidly in the middle ages, and by the 14th Century it was one of the three commonest names in use in Northern England and Scotland. 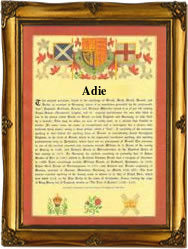 The extent of its popularity is well borne out by the number of surnames that it generated, and these include Adams, Adhams and Adamson, all patronymics, to the diminutives Adnett, Ade, Addkin, Atkin, Adcock, Addie, Adie, Adey, and no doubt others as well! Early examples of the surname recordings include Matilda Addy, listed in the Yorkshire Poll Tax Returns of 1379, Donald Ade of Dunblane, Scotland in 1465, William Adee in the Suffolk Subsidy Rolls of 1524, and James Adie, the M P for Perth in 1595. Other recordings from church Registers include the christening of Jane Adey, daughter of John Adey, on September 29th 1584, at St. Dunstan's in the East, Stepney, and the marriage of John Addie and Marye Coale at St. Bride's church, Fleet Street, London, on January 23rd 1620. The first recorded spelling of the family name is shown to be that of Thomas Ady, which was dated 1327, in the "Subsidy Rolls of Worcestershire", during the reign of King Edward 11, known as "Edward of Caernafon", 1307 - 1327. Surnames became necessary when governments introduced personal taxation. In England this was known as Poll Tax. Throughout the centuries, surnames in every country have continued to "develop" often leading to astonishing variants of the original spelling.